I am Sammy Pepys: not a doctor or a nutritionist, simply a well-informed, concerned layman who has become increasingly suspicious of today's conventional wisdom when it comes to diet, health and the lack of progress on tackling the growing rates of obesity, type-2 diabetes and related diseases. I have advised numerous people on low-carb diets and seen their health and energy levels rise. Although with this approach to eating, your total blood cholesterol levels can rise, I have come to believe that this a good thing as long as you do not promote oxidised cholesterol. Importantly, on an LCHF diet, your levels of triglycerides are likely to decrease while your HDL or 'good' cholesterol usually goes up. Weight loss is also associated with this eating approach (I lost 7 kilos and kept them off) but it's feeling good and having more energy which tops the list for me! That being said, the information on this website represents my learning and experience and does not constitute medical advice. We are all different and respond in our own ways to foods and medicines. 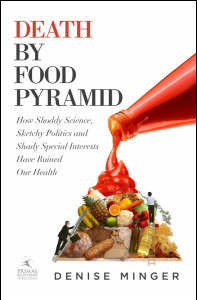 His favourite book about the realities of the food industry is Denise Minger's Death by Food Pyramid. Put simply: if you expect the food industry or governments to help change the way we eat in order to make us healthier, you are wrong. It won't happen. Just for the record: Denise’s approach isn’t specifically low-carb or high-carb, vegan or carnivore, raw food or cooked food, or anything else that could be neatly labeled. Her own experience as a (recovered) raw vegan taught her that diet-dogma is a killer, so her emphasis is on unraveling research rather than building an ideology. Her goal is to make nutritional science accessible and non-boring to those people who really care about their health. A recommended read. 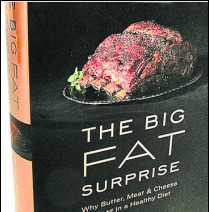 In a similar vein, Nina Teicholz, who spent 10 years researching and writing this book, documents the story of how back in the 1950’s, Ancel Keys and other apparently arrogant researchers, began leading us down the path towards our current, well established fear of dietary fat. In this fascinating expose, she argues that the resulting attempts to make our diet healthier by eliminating fat in our foods have - through that well-known ‘law of unintended consequences’ - led many of us to become fatter, and chronically ill.
She interviewed Jeremiah Stamler, a colleague of Ancel Keys back then, who went on to lead the Multiple Risk Factor Intervention Trial (MRFIT), a $115 million experiment carried out from 1973-1982. Nina Teicholz explains how the trial was a catastrophic failure for the diet-heart hypothesis and yet still, it changed nothing for the eating guidelines created by the nutrition establishment. She goes on to take issue with the olive oil lobby, famous for being linked to the benefits of a Mediterranean diet. “…when [famous Harvard University nutrition professor] Walter Willett unveiled the Mediterranean pyramid in 1993, no controlled clinical trials of the diet had ever been done.” They still haven’t. Soybean Oil is her next target… She reveals a disturbing graph published in the American Journal of Clinical Nutrition showing how soybean oil consumption has skyrocketed. “Americans now eat over 1,000 times more soybean oil than they did in 1909, the biggest change in the American diet.” Another untested experiment? And there’s much more in this riveting but controversial expose. Although he didn't refer to it as Low-Carb, High-Fat, this was essentially the slimming recipe presented by John Yudkin, the other big nutritional scientific voice together with Ancel Keys in the 60's and 70's. Ancel Keys linked fat and cholesterol to heart disease, whereas John Yudkin was sure that the true problem was mankind's demand for sweeter foods... the addition of more and more sugar, particularly in processed foods. "I bought this book because I had it in my teens and lost loads of weight using it - now the years and the children have caught up and other diets don't seem to really keep the weight off! I tried to find my copy but I couldn't so I ordered this one. It came within 5 days and it's in excellent condition, much better condition than I think my copy would have been in! I've been following the diet now for 10 days and the weight is coming off steadily. I'm very glad that I bought this book". A favourite of mine first published in 1958, by author Dr.Richard Mackarness, who was truly ahead of his time. He went on to become Britain's leading expert on food allergy related disease before dying in 1996. 'Eat Fat and Grow Slim' was his first book and exposed the "calorie fallacy" while proposing a non-carbohydrate "Stone Age" diet of protein and fat with no restriction as to the amount eaten. 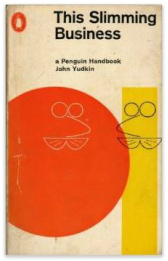 The book was immensely popular, particularly in the USA, and went through six editions. It still provides relevant insights today. Our ancestors took it for granted that sugars and starches made us fat, but we seem to have forgotten that... and now we are facing an obesity crisis. 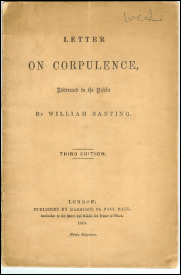 Read the original low-carb slimming success story as documented by William Banting in 1869; that's nearly one hundred and fifty years ago. "Banting up to date" was Dr Richard Mackarness' alternative title to 'Eat fat and grow slim'. This cartoon is taken from his book. This is one of my favourite books on cooking and nutrition. The comments on grains and bread were way ahead of their time and are still relevant today. Because of the late Dr.Enig's experience and knowledge about fats of all kinds, those comments are insightful too. "This book is an absolute must for anybody who is confused by the plethora of diametrically opposed nutritional 'advice' that permeates our health-conscious society. 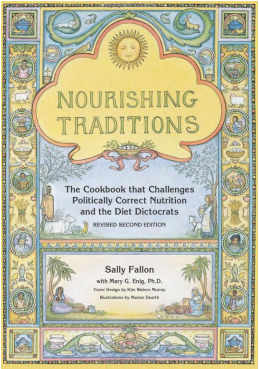 Although it describes itself as a 'cookbook' there is actually a tremendous amount of material that points out how far removed we actually are from sound nutrition, in spite of what various 'Diet Dictocrats' would have us believe. Among the many pearls of wisdom that the author points out is the fact that animal fat - yes, that substance that we have been taught to revile - is actually necessary for good health, and that this fat has been sought after for centuries by primitive peoples free of degenerative diseases. Every one of her claims, many of which contradict 'conventional' nutrition dogma, is backed up by reputable scientific evidence, and the fallacies of conventional dogma are exposed for the lay reader." The recipes are pretty fantastic, as well, although be warned! This is a book for those who are serious about improving their health. Good, health building food does not keep for 3 years in a cardboard box on the supermarket shelf, it can't be microwaved in 5 minutes, and it can't be replaced by a synthetic compound in a pill... ".